After 30 takes and 2 trips to CVS, I made it (errr, them) in time. 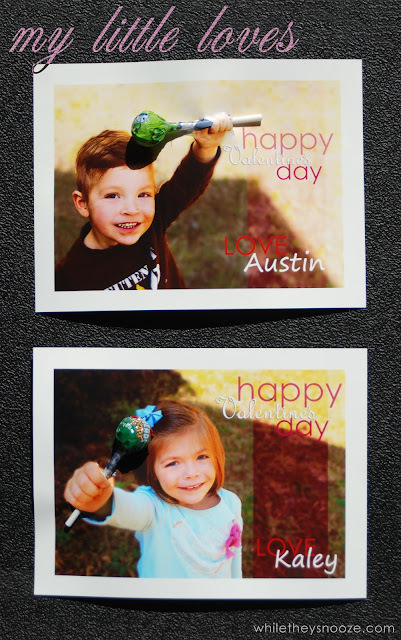 The kids will have Valentine's to give out to their friends today at day care. I'd love to take credit for this super cute idea, but I found it on Pinterest. When I first saw it I thought, "easy, I can do that". Then I tried to take their pictures. Not easy. First, you have to get the kid to look at you and smile (challenging enough and most of the time you look like an idiot... it's all good... other parents understand). Next, you have to make sure their hand is far enough away from their face so the lollypop won't be on their face when it's all done. You also have to make sure you leave enough space around their hand so the lollypop isn't hanging off the picture. Combine all of that with a good expression, no sun in their eyes, no boogers/dirt on their face and you get 30 outtakes and one salvageable picture. Phew! My advice would be, start taking the pictures in early January. To get my 2-year-old to cooperate, I told him to hand me imaginary things... "Do you have Dinosaur eggs for me?!" Which seemed to hold his attention for 30 seconds while I got some shots. Most of the time his hand was over his face so I'd run around him to get him to turn. The 4-year-old was much easier and understood "move your hand over". 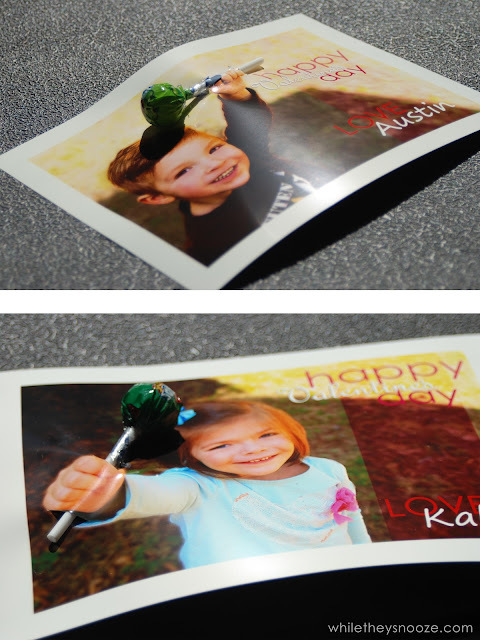 I had the prints done via our local CVS and did 4x6's for their friends and 5x7's for their teachers. I cut little slices near their hands with a razor blade and let my 4-year-old help me put them together. She loved sorting the lollypops into "boy colors" and "girl colors". This took effort... more effort than just buying the princess cards or the Mickey Mouse cards at the store (which I'm not knocking.. I was close to getting them) but I'm glad I did it. After all, my little loves are growing up quick. Pretty soon they're going to be getting real Valentines from their boyfriend or girlfriend (eek!) and I'm going to miss the days when they sat at the kitchen table with me sorting lollypops. Love your valentine cards for the kids!